In the Iranian system, the highest-ranking political authority is Supreme Leader Ayatollah Ali Khamenei, who succeeded Ayatollah Ruhollah Khomeini in 1989. Khamenei has been calling for Israel’s destruction for many years. Lest there be any confusion about the meaning of Khamenei’s words, the next day, he published a photo on Twitter that appeared to show Israeli soldiers with a German shepherd attacking a Palestinian woman. The supreme leader’s statement, in plain English, was overlaid on the photo: “Israel is the sinister, unclean rabid dog of the region.” In Islam, dogs are traditionally seen as impure. Adding the modifier “rabid” leaves only one interpretation about what the dog’s fate should be. 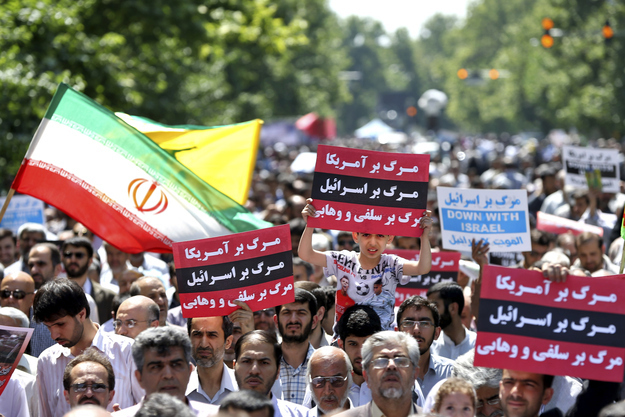 The danger of the Iranian regime is not confined to the rhetoric of its leaders. As demonstrated in the above quotes, Iran’s desire to see Israel destroyed is clear, but even more worrisome is the fact that the Islamic Republic is developing the capabilities that will enable it to carry out its intentions. The Iranian Armed Forces regularly hold military parades in Tehran. One of the main displays in such parades are truckloads of Shahab-3 missiles, which have a range of 1,300 km. (800 miles) – far enough to strike Israel. Fixed on the front or side of these missile trucks are banners that read, “Israel must be wiped off the map.” The message is often translated into English by the Iranians themselves. On Sep. 22, 2013, Iran’s new president, Hassan Rouhani, attended a military parade, reviewed the forces, and addressed the crowd. He was accompanied by the heads of the Iranian Armed Forces. Seated to his right was the Chief of Staff, Maj. Gen. Hassan Firouzabadi, and to his left was the commander of the Revolutionary Guards, Gen. Mohammad-Ali Jafari.